We didn't make any Iron attempts the following year. But, in 2010, an El Nino winter blossomed, offering excellent snow coverage in the San Gabriels. Once again, we considered and dismissed the Heaton Flat approach. As before, we figured traversing San Antonio Ridge gave us the best chance of summiting Iron Mountain with skis. This time, we eschewed overnight gear, starting instead at Manker Flat at 2 a.m. with the plan being to escape via a car dropped at Heaton Flat in one mighty marathon day. This time there were four of us—but that number went down to three when Bill decided to turn back at Baldy's summit because of leg cramps. As for friends Dan, Al, and me, San Antonio Ridge proved icy yet again, but not icy enough to dissuade us from trying to ski it. From West Baldy's 10,000-foot summit, we made it all the way down the ridge to the low point between Mount Baldy and Iron Mountain, elevation 7200 feet. Discovering the depth and breadth of the incredible terrain on Baldy's west side was a fine reward on its own. But our objective was Iron Mountain, and in that we were once again thwarted: a technical section of San Antonio Ridge stopped us in our tracks. 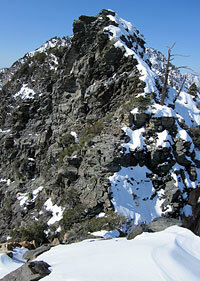 Known as the "Gunsight", we'd hoped to find this part of the ridge covered with enough snow to make for easy passage. Instead, we saw only exposed mixed climbing on crumbling rock. We looked at it, cussed at it, and shook our fists at it, but none of us were willing to try to climb it with skis on our backs. And at that moment, who should appear skiing down San Antonio Ridge but Dave Braun, the man who pioneered the Giant's Steps Couloir on Mount Williamson. Dave had learned of our San Antonio Ridge attempt and was chasing us. Now, I must confess I had a few unchristian thoughts at that moment. Did Dave know about Iron's North Couloir? I wondered. Because if he did know our real top-top-secret objective, of all the people in the Great State of California and maybe even the entire planet beyond, I knew Dave was just crazy enough to want to try to ski the damn thing—and more than talented enough to pull it off. What followed was a coy conversation between Dave and me in which I tried to glean exactly how much he knew about what we were really doing there on San Antonio Ridge without giving anything away. As for our Iron Mountain attempt, it was obviously over. We had only to decide now how to get home—and climbing all the way back up to Mount Baldy's summit didn't sound particularly appealing. Noticing snow leading down into Coldwater Canyon, we checked our map, which seemed to show a trail nearby. And so we decided to go off route, abandoning the ridge, hoping we would eventually connect with our car at Heaton Flat. For more on how that adventure turned out, please see my San Antonio Ridge Traverse video. Suffice to say, going off-route in the San Gabriel Mountains is almost never a good idea, and it certainly wasn't on this occasion, which involved over 47 creek crossings through fast rushing water in the dark. Back home and nursing our wounds, there remained the question as to whether or not Dave knew about the couloir we were trying to ski. He did: he'd seen one of my scouting photos in a group email I'd sent to Al, Dan, and Bill. And of course Dave wanted to ski it. What followed was a series of tense negotiations via email. I was leaving town for two weeks and feared Dave would try to ski the couloir before I got back. Dave was out of town the following two weeks, and didn't want me to ski it while he was gone, either. But would the snow hold long enough to wait a full month? Eventually, we made a gentlemen's agreement to wait until the next time we were both available to ski the couloir. The date was set, and with Dave on-board now, I knew there was little question we would ski Iron Mountain's north face—if it was at all humanly possible to do so.